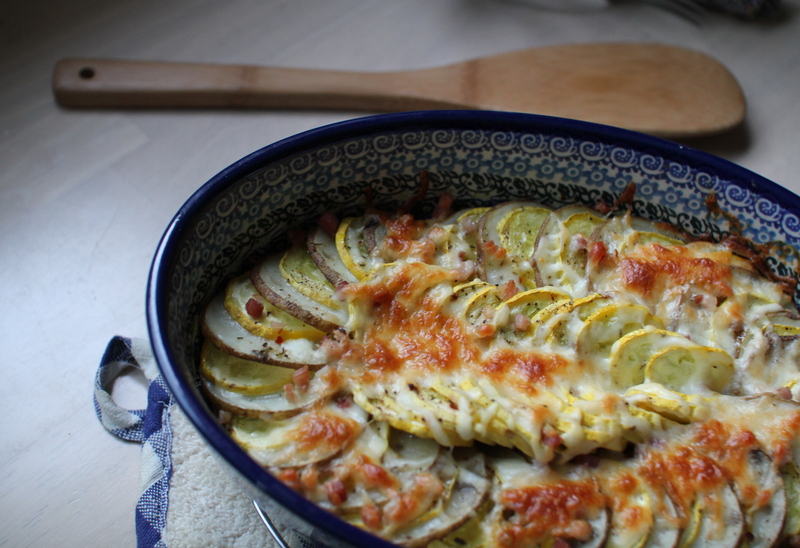 Provencal Yellow Squash and Potato Gratin [recipe] – Cin Cin, Let's Eat! It was 5pm and the only vegetables I had on hand were one little yellow squash and a russet potato. Who would want to go to grocery store after a crazy day of work? Thanks to a little inspiration from the very adorable movie Ratatouille, and this recipe, I easily assembled and popped this in the toaster oven (Yes, I didn’t even have to use the regular oven!) and it was done by the time my better half was home from work. Oh, and a little fun fact – Did you know Chef Thomas Keller of French Laundry, Per Se, Bouchon, and Ad Hoc, was hired as a consultant for the movie Ratatouille, and that he actually serves the movie titled dish at his 3-Michelin-Starred restaurant French Laundry? Does this baking dish look familiar? This is one of my favorite baking dish. It’s just the right size to fit in our toaster oven, yet it holds a good deal of food! This precious Polish Stoneware was given to me as a Christmas Gift, and I just adore it so much! 1 small Russet potato, clean of dirt. Spray a small baking dish with the cooking spray. Using a mandolin, slice the squash and potato, about 1/4-inch thick. You can also do this with regular knife. But mandolin certainly helps making the vegetable cuts more uniform. Season with salt and pepper, add herb de Provence, then lightly drizzle olive oil over vegetables. Cover with foil and bake for 30-35 minutes. The potatoes should be tender. Remove the foil, sprinkle with mozzarella cheese, then bake for another 35 minutes, or until the cheese is browned and bubbling. Every oven acts differently, so check accordingly. This is a great dish for summer vegetables. I have also tried with zucchini, onion, tomato, and eggplant. Delicious flavors! If you don’t have herb de Provence, simply use dried or fresh rosemary leaves. You can also use dried oregano or any Italian herb blend.